Doing business over meals is a ritual that has existed for centuries. Taking clients to breakfast, lunch or dinner has long been an effective way to build relationships, make the sale or seal the deal. These business meals are essentially business meetings. Knowledge of your product or your service is crucial to the success of the meeting, but so are your manners. 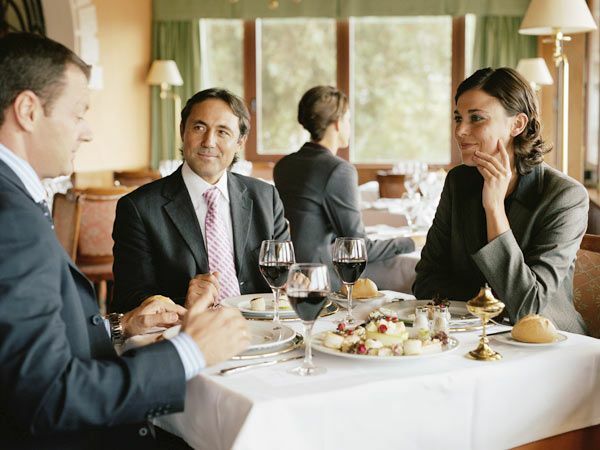 Too many people jeopardize an opportunity because they fail to use good dining etiquette. Allow a week for a business dinner and three days for lunch. Be certain that the date works for you. That might sound obvious, but if you have to cancel or postpone, you can look disorganized and disrespectful of your clients’ time. Does it lend itself to conversation and discussion? If you and your clients can’t hear each other over the roar of the diners and dishes, you will have wasted your time and money. If your guests suggest a restaurant new to you (perhaps you are hosting clients out-of-town), call ahead and speak with the maitre’d. Make it clear that you will be having an important business meal and picking up the check. Be sure to confirm with the clients. This is the perfect time to give your credit card to the maitre’d and avoid the awkwardness that seems to accompany the arrival of the bill. That will depend on a number of factors such as the time of day and how well you know your clients. At breakfast, time is short so get down to business quickly. At lunch, wait until you have ordered so you won’t be interrupted. Dinner, the more social occasion, is a time for rapport building. Limit the business talk and do it after the main course is completed. However, because you have established a business friendship, you can eliminate some of the chitchat when time is an issue. When you don’t know your clients well, spend more time getting acquainted before launching your shoptalk. If you pay attention to the details and make every effort to see that your clients have a pleasant experience, they will assume that you will handle their business the same way. Before long you could have them eating out of your hand.